• The Radnor Historical Society’s Finley House, 113 W. Beechtree Lane, Wayne, built 1789. 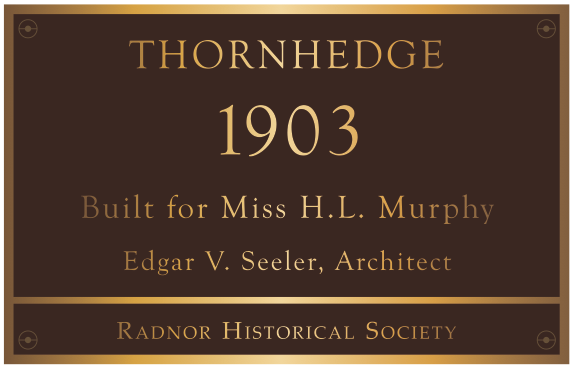 • Thornhedge house and carriage house, 260 Chamounix Road, Wayne, built 1903, owned by Kathleen Papa. • 142 West Wayne Avenue, Wayne, built c. 1881-1887, owners Bruce and Sandy Gilbert. the headquarters of the American Missionary Fellowship. • Bon Air, 425 Chestnut Lane, Wayne, built 1889-1890, owners Chris and Jill Stavrakos. • Nathan Matlack House, 425 Darby Paoli Road, St. Davids, built c. 1762-1783, owners Jamie and Hollie Holt. • 124 West Wayne Avenue, Wayne, built c. 1881-1884, owned by Bruce Norcini. • 221 Lenoir Avenue, Wayne, built c. 1921-1922, owners John and Martha Dale. • 200 South Aberdeen Avenue, built c. 1890-1893, owners Stephen and Suzanne Shuut. • 134 Poplar Avenue, Wayne, built c. 1904-1906, owner Amy Marren. • Kinterra, 706 Church Road, Villanova, built c. 1808-1814, enlarged 1994, owners William and Andrea Pilling. 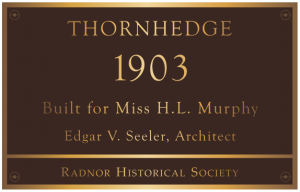 Applications for markers can be found on the RHS website, www.radnorhistory.org/marker, or may be picked up at the Finley House. The cost is $200. Having a marker does not carry with it any regulations or limitations on your property but is simply a recognition of your architectural stewardship.